One of the earliest lessons a novice milling machine operator will likely learn is that the spiral action of an end mill will, when taking a cut, attempt to draw the cutter from the chuck holding it. The result is that it becomes apparent the drill chuck supplied with the average mill drill is quite inadequate. Having purchased my first mill drill for around £600, I soon learnt this was so but was then dismayed to learn that a suitable milling cutter chuck was going to set me back in excess of £100. This seemed quite disproportionate compared to the cost of the machine. Because of this, I was led to consider making one, which I did, with the resulting chuck, Photograph 1, being more than adequate for over 15 years of use. I had though found that I would like to use endmills having a larger shank than the 1/2 in./12mm that my chuck catered for, and I therefore made a larger version to suit 16mm diameter but following the same design as the first. This uses endmills having threaded shanks which make it impossible for the cutter to be withdrawn in use. The larger chuck is seen in Photograph 2. Briefly, the way that these chucks work is that the cutter is screwed into the collet until it contacts the base of the chuck’s body. 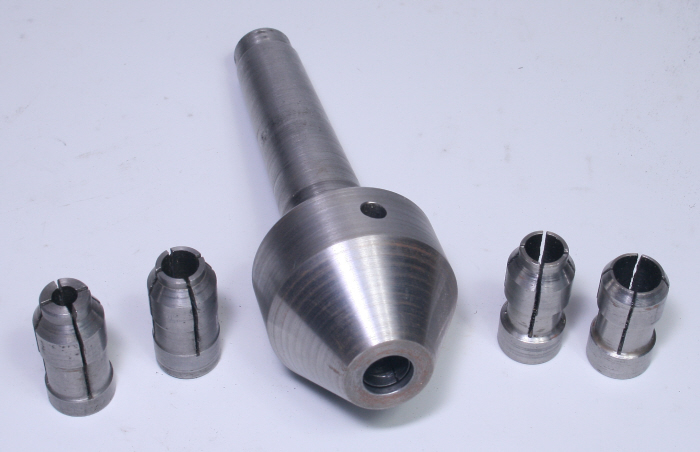 If then, the cutter rotates a little in the collet due to the load on it, it will attempt to screw father into the collet but being in contact with the chuck's base it will draw the collet forward into its closing taper. This, as a result, increases the collets grip of the cutter. From this, it can be seen that it is impossible for the cutter to be withdrawn from the chuck as it will always remain in contact with the base of the chucks internal bore. Sk.1 should help to make the above understandable. When I made my first chuck, I now know that the ER range of collets had been in being for around 10 years but was unaware of their existence. 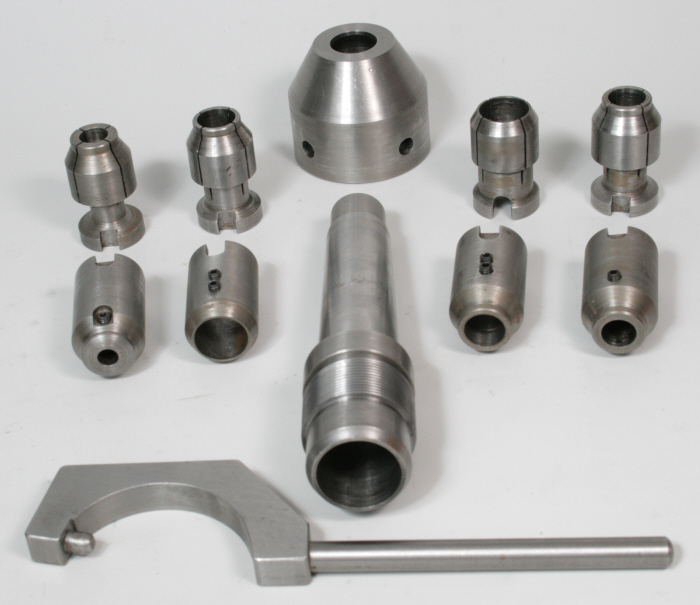 This because, at the time, it was obviously very much a collet for use in industry, and no doubt having an industrial price tag. I now have though a set of these collets that I use exclusively for smaller diameter work, 20mm and below, on my lathe and find them very useful. For the viewer who is not conversant with these, each one covers a range of 1mm and are made in 1mm increments, typically, 7 to 6mm and 6 to 5mm. From this it can be seen that there are no gaps in the sizes that can be held and can therefore be used for metric and imperial diameters.